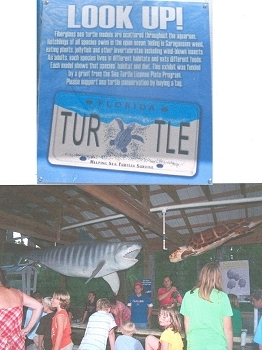 Summary: Florida's sea turtles feed on a wide spectrum of marine invertebrates, fish, sea grasses and macroalgae. Their habitats range from coral reefs, mangroves, and salt marshes to sandy, muddy estuaries and the open sea. In a new educational display, visitors to Gulf Specimen Marine Laboratory will see life sized fiberglass models of a leatherback, hawksbill, green, and loggerhead sea turtle.They will learn where turtles live, about habitat loss, the declining biodiversity of the oceans, and the urgent necessity to protect them all.